Throughout the season of Easter we have been reading a series of lessons from the book of the Revelation of John. These lessons will continue through May 12 – Easter 7. So far we have had the opportunity to explore a series of passages from chapters 1, 4 and 7 and then there is a jump to the end of the book – to chapters 21 and 22. So, our lectionary skips over chapters 8 through 19, which contain some of the most vivid and also difficult visions in the book. It is this part of the Apocalypse that includes the 7 trumpets, the 7 plagues, the beasts, the great harlot and the great battle. It is this section of the book that also has prompted some of the most outrageous interpretations. Hal Lindsay and the “Left Behind” series have managed to see nuclear war and attack helicopters in this part of the book. And many others point to these chapters a biblical proof that God will utterly destroy the earth and all those who are not a part of the inside crowd (usually defined as just those who agree with the interpreter.) And this destruction will come about in a horrific and terrifying manner. But “true believers” (whoever they are) will not have to experience any of this, because they will be “raptured” – kind of like using an escape pod to get away from the Death Star before it explodes I suppose. The terror and misery seen in these chapters seem only limited by the creative imagination of the interpreters. But make no mistake - all of this has been invented - it is NOT in the Biblical TEXT - including and especially the “rapture” which is simply not to be found in anywhere in scripture, but is rather a creative figment of a commentator's imagination that can be traced back to the 19th century. I want to be clear here - I unequivocally reject this interpretation completely. The Jesus who is presented by these interpreters bears no relation whatsoever to the Jesus we meet in the Gospels, or the Jesus that Paul bears witness to. There is no grace and no love in these interpretations – only judgment, violence and fear. There is no sense of the preciousness and uniqueness of creation, just a wholesale rejection of creation. As a Christian I must begin to evaluate all these interpretations by first going to the Gospel. Any interpretation that contradicts the Gospel must be rejected. 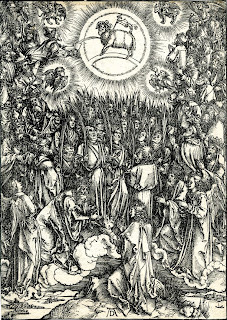 And, as we have seen in chapters 1 through 7, a close a careful reading of the Book of Revelation, which attempts to understand the cultural and social context of the writer and original recipients, reveals a book that is far from the violence, terror and judgment that some would read into it. Revelation has shown itself to be a book which points to God’s amazing, startling and stunning commitment to the creation and indescribable love through Christ the Lamb for all of humanity. Far from a desire to destroy the earth, God is constantly seeking ways of saving and renewing the beloved creation! And at the close of the book we are presented with a vision of a renewed creation – a New Jerusalem that is right here on this earth. God’s commitment to the creation, and God’s love of this creation is beyond comprehension. So what do some of these visions mean? There isn’t really space here to go into great detail. But let me make a couple observations. 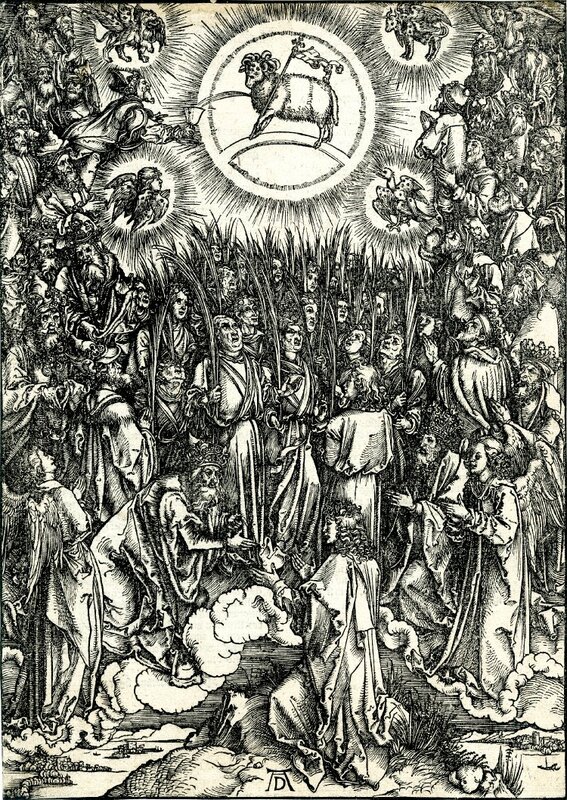 The 7 trumpets, for example, usher in a series of plagues each more horrid than the last. But at the conclusion (chapter 10) there is a surprise. Just as we expect the final destructive terror to be unleashed God puts a stop to it. “Seal up what the seven thunders have said and do not write it down.” (10:4) John is then told to eat the scroll that contains the horrors because, it is noted that none of the terrors and judgment have brought about repentance. And since that – repentance, redemption and salvation – are what God really wants we now find things moving in a different directions. The plagues, it turns out are a vision of what might be. This is what we expect: judgment and terror. And so John is shown what the result of that course of action will be. But it proves to be completely ineffective as it does not bring about what God in Christ desires above all else. So it is rejected! Violence, judgment, terror, horror are all rejected in favor of Grace! And if we jump to the end, to the infamous Battle of Armageddon, we see the exact same thing even more profoundly. Despite a vision of the seemingly invincible and terrifying amassed forces of evil, Christ nevertheless wins the victory decisively without any violence at all. It is the Word (19:15) which comes from His mouth that defeats the powers of evil – violence, fear and terror. And that Word is a word of Grace. This brings us back to the central question of the Book of Revelation – How then are we to live in this world as a Christian; how does our faith in Christ inform and impact how we live in the world as a follower of the Lamb? Ultimately John of Patmos is calling for believers to make a commitment to live in ways that reflect the love and grace which God has showered upon them; to reject the seductive powers of this world that seek to ensnare and destroy us (power, violence, possessions, injustice) and make a commitment to care for God’s wonderful creation and to love others as Christ loves us.